The Boathouse at Bangor gave us one of the finest meals of our trip – in every possible sense. The service was spot-on, the dishes were inventive and delicious, the portions were the right size, the atmosphere was perfect AND we got to chat with the chef about his creations! STARTERS – 42˚ C poached Glenarm organic salmon, sour dough croute, sweet & sour red cabbage, red cabbage gel, chocolate & cumin mayonnaise; Belfast Lough crab & pineapple ‘lasagne’, soy marshmallow, wasabi yoghurt, toasted sesame seeds, bitter cress, chilli, saffron & lemon grass syrup; MAINS – Grilled fillet of turbot, prawn reduction, prawn tortellini, grilled langoustine, pea gel, Strangford Lough samphire; Pan-fried Carlingford Lough sea trout, white asparagus, hollandaise sauce, pistachio crumb, chateaux potatoes. 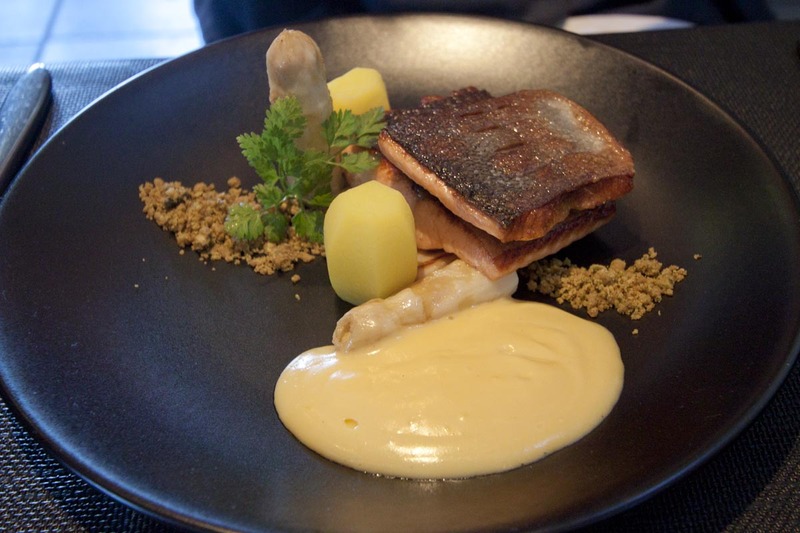 The trout was especially fine – so moist and flavoursome in the flesh, but the skin was VERY crispy (due to extra scraping which dries it more, according to the chef – he was thrilled with the detailed feedback, and shared my preference of trout over salmon). The gorgeous little stone building that houses the restaurant used to be the office of some harbour official, and was very atmospheric It was a completely delightful fine dining experience, and I would not hesitate to return. 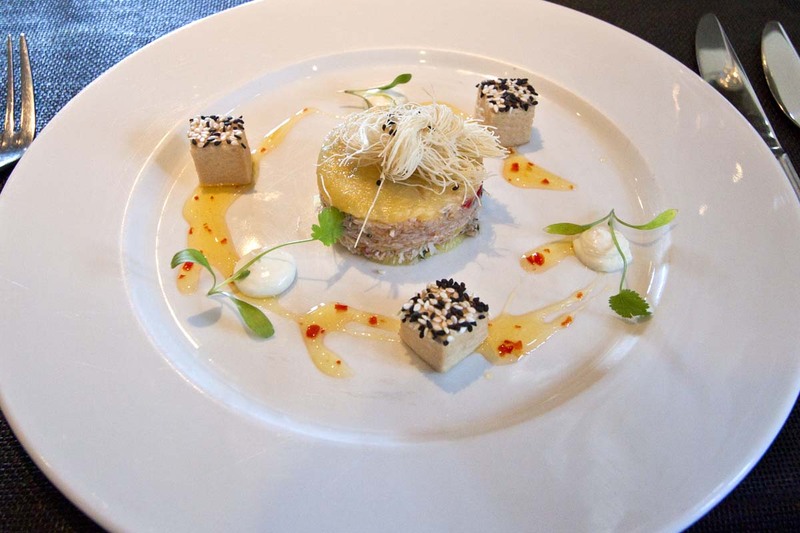 This entry was posted in Restaurants, United Kingdom Restaurants and tagged Belfast Lough Crab and Pineapple Lasagne, Boathouse Restaurant, Crab Meat Stack, Pan-Fried Carlingford Lough Sea Trout, Strangford Lough Samphire by bontaks. Bookmark the permalink.